The big news item during the past year was, of course, the postponement of the World Congress due to the S.A.R.S. epidemic. We very much look forward to finally getting together in Tianjin on April 1-4, 2004. The Chinese organizing committee has worked very hard to make this an outstanding event, and it was a great disappointment to them when it became necessary to postpone the Congress. I trust everyone will make the effort to attend, even though the new dates may not be optimal. We had to accept the dates that the organizing committee could get reservations in the facilities at short notice. The postponement of the World Congress affected IFToMM in multiple ways. In order to comply with the provisions of the constitution, it became necessary to schedule an Executive Council meeting during calendar year 2003. That meeting was originally to have taken place at the World Congress. The Executive Council met in Chicago on August 30th, 2003. The 2004 meeting will now take place at the World Congress. The terms of the current members of the Executive Council expire December 31st, 2003, so it was necessary to hold the election of a new Executive Council by email. Once again, the election is normally held in the General Assembly at the World Congress. That process is now completed, as reported elsewhere in this Newsletter. The organization owes a vote of thanks to Tatu Leinonen and Jorge Angeles for conducting the election and assembling the slate of candidates. I look forward to continuing for another four years as President, and to working with the outstanding group of people who have been elected to the incoming Executive Council. Another result of the postponement has been to throw the World Congress into a year in which we already have a very full schedule of IFToMM conferences. We have HMM 2004 in Cassino, Italy May 12 to 15, ROMANSY 2004 in Montreal, Canada June 14 to 18, ARK 04 in Genoa, Italy, June 28 to July 1, an International Conference on Theory of Machines and Mechanisms in Liberec, Czech Republic August 31st to September 2nd, and the Symposium on Recent Trends in Automation and its Adoption in Industries in India at the end of the year. Among other things, this has led to the IFToMM budget for 2004 being grossly overloaded. The Executive Council has had to make some difficult decisions to not support some activities during 2004 for this reason. We regret that this has led to some scheduled events being postponed. Once again, it is my sad duty to note the passing of valued colleagues. Professor Giovanni Bianchi passed away on November 13th, 2003. Professor Bianchi was a past president of IFToMM and had been active in the organization right from its inception. He will be remembered for the ROMANSY conferences that are co-sponsored by CISM and IFToMM. CISM: the International Center for Mechanical Sciences is located in Udine Italy where the conference has been held on a number of occasions. Professor Bianchi represented CISM on the organizing committee until quite recently, and was co-chair of that committee for many years with the late Professor Adam Morecki. I would like to also take note of the passing of Professor Ali Seireg during the past year. Professor Seireg was the U.S. chief delegate to IFToMM for many years, and served a term on the Executive Council. I would like to thank, once more, all IFToMM Officers that have contributed to the past issues of the IFToMM Newsletter, and the supporting emails I have received for the past few years. It was sad to hear about the passing of Professor Giovanni Bianchi. I met him for the first time at the 10th World Congress on Mechanism and Machine Science, in Oulu, Finland, and was touched by his warm personality and kindness. It is sad that many dear colleagues and very well known researchers left us in the past few years. This issue of the Newsletter contains a message from Professor Kenneth Waldron, IFToMM President, highlighting the IFToMM activities in 2003 and the 2003 World Congress which has been postponed to April 2004 due to the SARS outbreak; a message from Professor Tatu Leinonen, Secretary General, regarding the IFToMM Executive Council; as well as several contributions from IFToMM Officers. Similar to previous issues of the Newsletter, the contributions are published in any of the four IFToMM official languages, English, French, German, and Russian. Contributions submitted in other official languages than English are expected to be accompanied by an English abstract. I will continue to look forward to receiving your contributions for the 2004 issue of the Newsletter, preferably as a WORD document or in PDF format. The major activity since the last meeting of the Executive Council has been in association with the World Congress. In particular, the very unfortunate circumstances that led to the postponement of the World Congress from August 18-21, 2003 to April 1-4, 2004. The President wishes to thank the Chinese organizing committee for their flexibility and cooperation in this very difficult situation. With the SARS epidemic now behind us I trust that we will have a very successful World Congress next April. Other activities will be covered in the reports of the respective PC’s and TC’s. The Minutes of the 35th Executive Council Meeting were written and, after approval by the President, distributed together with all appendices to the members of Executive Council, Chairs of Permanent Commissions, Technical Committees and IFToMM Member Committees. The decisions of EC were also reported in IFToMM Newsletter Vol11-1 and on Internet. The Minutes of the 35th Executive Council meeting was sent to the members on November 12, 2002. The Invitation to EC Meeting in Chicago on August 30 - 31 was sent on May 27, 2003. IFToMM World Congress, General Assembly, and Executive Council Meeting was originally planned to be held on April 2 - 4, 2003 in Tianjin, P.R. China, but because of SARS epidemics they are postponed to April 1 - 4, 2004.
International Conference “Vibroengineering -2002”, October 18 - 19, 2002, Kaunas, Lithuania. Dr. Robert Bicker submitted the Treasurer’s 2002 Report. According to Dr. Bicker’s Report, some countries have not paid their subscriptions for several years. Professor Jorge Angeles offered Dr. Bicker his help in dealing with the most difficult cases. The Treasurer presented the budget for 2003, and proposed budget for 2004, which were accepted. IFToMM Constitution Committee has made the proposal to General Assembly to “changes in IFToMM constitutions”. EC discussed the proposal and decided to recommend its acceptance by the General Assembly. IFToMM General Assembly decided to accept the application of Chinese member committee to have the next IFToMM World Congress in 2003 in Tianjin China , April, 1-4, 2004 (postponed from August 2003). Professor Tian Huang reported on arrangements for the congress. Professor Carlos S. Lopez-Cajun has invited to have the 12th IFToMM World Congress in Mechanism and Machine Science on June 18 - 22, 2007 in Guanajuato, Mexico. IFToMM French member committee has presented an invitation to host the 12th IFToMM World Congress on June 11 - 15, 2007 in Besancon, France . Professor J.-C. Guinot explained the plan in EC meeting. The EC was grateful about these invitations, discussed them and recommends them to the General Assembly. The decision of the date and place of the 2007 World Congress will be made by the General Assembly on April 3, 2004. Professor Tian Huang kindly invited the EC to Tianjin, P.R. China, on April 1, 2004 to hold there the next meeting. The invitation was accepted. 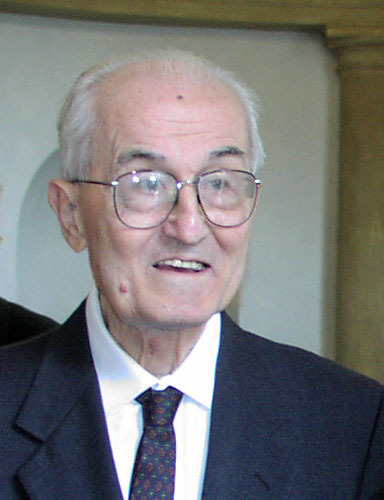 Giovanni Bianchi, scientist, university professor and Past President of IFToMM, passed away on 13th November 2003 , in Milan . Born on 11th March 1924 , in Como , he registered at the Faculty of Mechanical Engineering at the Politecnico di Milano and, after obtaining his degree, obtained a Master in Mechanics from Cornell University - Ithaca , New York , where he studied the propagation of shock waves in metals, publishing some articles that are well-known in literature. On his return to Italy , he began working at the Politecnico di Milano, where he dealt with mechanisms and vibrations from a mathematical and experimental point of view with results that, in 1970, enabled him to take on the chair of Mechanics Applied to Machines. More recently, he was appointed Professor Emeritus. Giovanni was a founder of institutions and a maker of people and scientists. He contributed to the founding of IFToMM when the energy involved in creating innovative international cultural interchange required tenacity, faith and creativity. The idea of a scientific basis for machine mechanics and mechanisms was developed in Zakopane, a project to which Giovanni dedicated both passion and commitment. For many years he acted as General Secretary and President of IFToMM and is remembered by everyone for his innate ability to propose ideas and promote culture. Within the context of IFToMM, in conjunction with his friend Adam Morecki, he directed the Robotics Committee, proposing the Romansy Symposiums, a reference point, from 1972 until now, for scientists, academics, designers and researchers. Giovanni held the position of General Secretary of the Italian Association of Theoretical and Applied Mechanics (AIMETA) from its foundation in 1965 until 1982, contributing to the creation of the International Journal MECCANICA and acting as its President from 1982 to 1986. He was also the Italian representative of the International Union of Theoretic and Applied Mechanics (IUTAM). From 1977 to 2000, he was General Secretary of the International Centre of Mechanical Sciences (CISM) in Udine . When programming and organizing courses, seminars and international conventions he was totally committed to maintaining not only a high scientific level but also a contemporary view of the subjects dealt with, thus ensuring the international prestige of CISM. The development of activities in innovative sectors related to his studies and interests, such as Robotics and Biomechanics, is due, above all, to his work. His research activity meant that more insight was gained into the fields of linear and non-linear mechanics, mechanisms, articulated systems, robotics and system dynamics. On a more general level, he dealt with the most innovative aspects linked to mechanics. Giovanni regarded knowledge and action as a means of communicating with others, thereby offering all those involved the best of all worlds. Creating study and research centres, indicating possible guidelines, offering new approaches to know-how and consolidating them with simplicity is just one way of laying solid foundations for human thought and Giovanni Bianchi, with his serene, humble, simple and humane approach, was one of the main protagonists in the sector of mechanical sciences intended as a theoretical and concrete science. His scientific interest was combined with his passion for music: a talented cellist, he enjoyed playing with friends, occasions which afforded him enormous spiritual harmony. His strict scientific leanings were combined, as everyone will remember, with a warm personal approach. Wherever he found himself, there was always a magical word of advice. He reflected deeply on matters, always showing kindness, humility and depth. Many friends have been sadly affected by the loss of Giovanni. However, his enormous following of scientists, young researchers, members of IFToMM, of CISM, of the Politecnico di Milano and of the international scientific community, will ensure that his memory lives on, the memory of a considerate, warm human being and scientist. Lately within the world-wide scientific community the success of a journal seems to be measured mainly through the numerical value of its published “impact factor”. Indeed, for purposes of promotion and tenure decisions in scientific fields, the impact factor has become a way to determine whether a scholar is publishing his or her work in the quality journals of a particular field. For this reason, authors often prefer to send their work exclusively to those journals having the highest possible impact factor ratings. The impact factor (IF) is a well-known measure that has been formulated by Eugene Garfield of the Institute of Scientific Information (ISI) as a useful data base for libraries. ISI is a private, for-profit company that is best known for publishing the Citation Index series of references. In analyzing the information that it publishes, ISI automatically collects and maintains the data needed to compute the impact factor for many of the major scientific journals found in libraries. The actual impact factor for a journal is calculated by using the number of citations to articles published in that journal in the previous two years as appearing in the Citation Index of ISI. Using this number, the impact factor is computed as the ratio of the number of citations divided by the number of articles that are published by that journal in the same time period. Mechanism and Machine Theory (MMT), is the only journal of IFToMM that has received an impact factor rating. Its rating is 0.286 as published in 2002. This impact factor ranks it as 62 out of 102 journals in the various fields of mechanical engineering. What is really an important issue then is whether the impact factor as published by ISI is a true and fair measure of the contributions that a journal is making to its field. For our own organization, IFToMM, another important issue is whether our journals are best serving the needs of our part of the scientific community. If the answer to either of these questions is no, then there may be a need for action. The first question can have a straightforward answer if one considers how the impact factor itself is formulated. Since the IF depends on the number of citations that authors make in the references section of their papers, the more citations that are made, the higher will be the resulting impact factor. Thus by requiring its authors to make more reference citations to its papers published in the past two years, a journal can greatly improve its impact factor without any change in the quality of the papers it publishes. It seems clear that the tradition and procedures with respect to the handling of references can thus have more influence on the impact factor of a journal than the actual content of its published papers. This is truly unfortunate. Indeed, some journals having high impact factors regularly publish articles with three to five times the number of references as those found in articles published by the IFToMM journals. In some fields authors are encouraged to cite references without any indication of why the content of these references is relevant to the new material they are publishing. In short, we could conclude that the answer to the first question posed is no. Most members of the scientific community would agree that the impact factor is greatly overrated in its ability to measure quality. The use of the impact factor for a cross comparison of journals from different scientific fields is a process that has significant pitfalls. Even two journals of high quality in the same scientific field cannot be compared using the “impact factor’ if they operate with highly different publication norms. For this reason, users should interpret and use the impact factor with great care and with a full understanding of what it actually means. The impact factor is what it is—no more, no less. While most of us would agree that it is not a good idea to use the impact factor as the sole basis for judging the overall quality of a journal, we would also agree that it would be difficult to create an alternative scheme that would give better results. The real challenge in this part of our discussion is to look for other ways to quantify the overall quality of a journal and its impact on a particular scientific field. To develop a fair and accurate evaluation scheme that would quantify quality would be a great service to the entire scientific community. It is a challenge that is worthy of the best minds that our various scientific fields have to offer. With respect to the second question posed, there is no single measure that can be used to determine if a particular journal or group of journals are actually serving the needs of their constituencies. Yet, there are many appropriate questions that could be used to gather data to support such a judgment. For example, one measure of relevance and service might be to look at whether a journal continues to draw papers from the community it strives to serve. By this measure our journal MMT has enjoyed an excellent rate of growth in papers submitted over the 38 years of its existence. The past volume year was the best ever for papers submitted with the number topping 150 papers received. Another measure of relevance is found by looking to see if the scope of the journal has changed as the scope of the parent organization has evolved. In this regard, MMT has seen a steady increase in the publication of papers from such new fields as computational kinematics and robotics as these parts of IFToMM have matured. In addition, MMT has expanded its coverage of papers published to include the history of machines and mechanisms as this part of IFToMM has seen expanded interest. Another measure of service to the community might be found if one looks at the highly global nature of IFToMM activities. In this regard MMT draws more papers from a greater diversity of countries than any of its counterparts in the field of mechanism and machine science. As the diversity of IFToMM has grown, so also has the diversity of the papers in its journals. Another measure of relevancy and service to the scientific community concerns whether a journal contributes to the growth of understanding of the terminology associated with its scientific field. The most recently published, triple issue on Standardization of Terminology (Vol. 38, Nos. 7-10) is an example of how MMT responds to the need to disseminate this type of information to our community. A significant part of relevance and service is related to speed of processing and publishing. While we would all like instant reviews, instant publication, and instant dissemination of our work, it must be recognized that careful, thoughtful reviewing takes time. Electronic submission and electronic reviews are beginning to reduce the process time for our journals, yet there is much additional work to do in this regard. In the final analysis, the relevance and service of our journals depend primarily on the volunteer help of editors, reviewers, advisors, and authors who work for the promotion and development of mechanism and machine science worldwide. While the domain of “impact factor” may be of doubtful value as a measure of quality, the domain of individual impact of people has never been stronger as a factor in the domain of quality. The use of robots has been increasing in industrial and non-industrial applications by becoming more and more useful and as common systems. Robotics is the Engineering Science that deals with the many aspects, even in Mechatronics approach, that are needed to know for a proper design and use of robots. An International Course on Robotics has been organized as directed to students at UNI (Universidad Nacional de Ingenieria) in Lima, Perù, but also to professionals and researchers with the aim to illustrate fundamentals of Robotics with hints on novelties in research and applications of robots. The course has been organized within the frame of the curriculum for Mechatronic Engineering at UNI that has been started since 1995. The course has been important and instrumental to initiate fruitful collaborations by promoting Robotics, IFToMM, South-American colleagues, and UNI in Lima with an international perspective. In addition, on occasion of the course UNI has given the degree of Doctor Honoris Causa to Professor Marco Ceccarelli in recognition of his scientific and academic carrier, and for the support to the UNI activities in the field of Mechanical Engineering. Control of Robotic Mechanical Systems, Telerobotics and Virtual Reality Systems, by Professor Robert Bicker (University of Newcastle upon Tyne, United Kingdom). The course program has been attended successfully by more than 180 UNI students, with the participation of 15 professors, and 9 professionals who came from all regions of Perù.